- There was no indicators whatsoever that University Avenue is in any capacity a state highway. I didn't see any post mile paddles or really anything Caltrans would generally supply. If I recall correctly CA 109 ends technically at Notre Dame. Hard to see what purpose that route was really meant to serve other than a quick (I say that with some sarcasm with the 25 MPH speed limits) connection to CA 84. - Again no post mile paddles or any CA 114 shields on the surface level of the route. Oddly there was still a CA 84 west shield at the ramp for US 101 which didn't say "TO." I thought that was odd that the CA 84 shield seems to be surviving the ramp reconstruction considering that 84 has long since been moved. I would have to imagine 114 is probably on the short list for relinquishment consideration once the ramp project is complete. Anyways...I know these are urban routes but it seems absurd that neither are signed. Maybe I'm spoiled by good signage in District 6 and all the neighboring Caltrans districts on small routes in the Sierras. Wrote up the first entry in this series on CA 109. The route obviously was meant to be a connector to the Dumbarton Bridge and not much else from the get-go. So the lone CA 114 sign on SB US 101 at exit 404 is gone? So the CA 114 sign on US 101 at exit 404 has disappeared? Looks like it from your photo album. 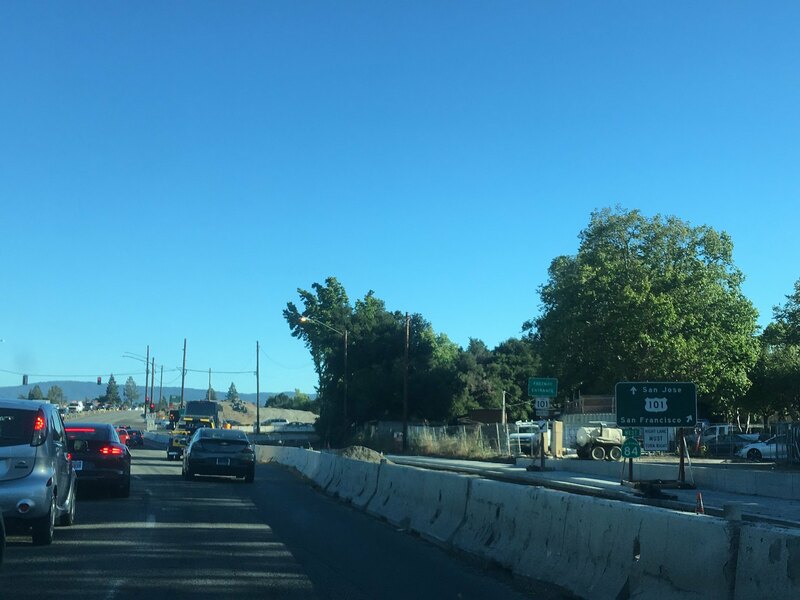 Sometime in the mid-'70's the definition of CA 84 and CA 114 "swapped" alignments; originally 114 was supposed to be Woodside Road from US 101 west to I-280, while CA 84 went west through Menlo Park and Stanford to I-280; the intent was to jog north on 280 to the current CA 84 alignment (114 would head east and 84 west). Obviously D4 planners had likely never met or conversed with residents in Menlo Park, Palo Alto, as well as Stanford student activists; the plan to put an expressway or freeway largely down San Francisquito Creek (the dividing line between Santa Clara and San Mateo counties -- I lived across the street from the creek from '76 to '81) would have been summarily abandoned if the residents could and would be heard. But it took about a dozen years after the CA 84 line on the map was drawn until the concept was effectively dead (money talks very loudly in that area! ), and CA 84 was moved up to Redwood City. CA 114 took over the Menlo Park alignment, but a formal route adoption never took place. The only consistent backers of the plan were the owners of the Stanford Shopping Center; the route would have passed along the north end of their parking lot! But once Stanford announced that they would never sign street-closure agreements for the route if it came to pass, the plans were cut back -- first to CA 82, and then all the way to US 101. CA 114 never stood a chance in this area -- and D4, despite periodic (and possibly quixotic) attempts at trailblazer signage along us 101, has no plans to sign the short "stub" route (which hosts numerous Facebook facilities). I was genuinely surprised there was so much to 114 that never came to pass. Certainly it turned out there was far more going on than a simple alignment change in 84 creating a new route. Some of those old city inserts had route numbers never existed at all beyond paper. Weird to consider the plans D4 had back in the old days when the current mind set is relinquish and unsign as many routes as possible.